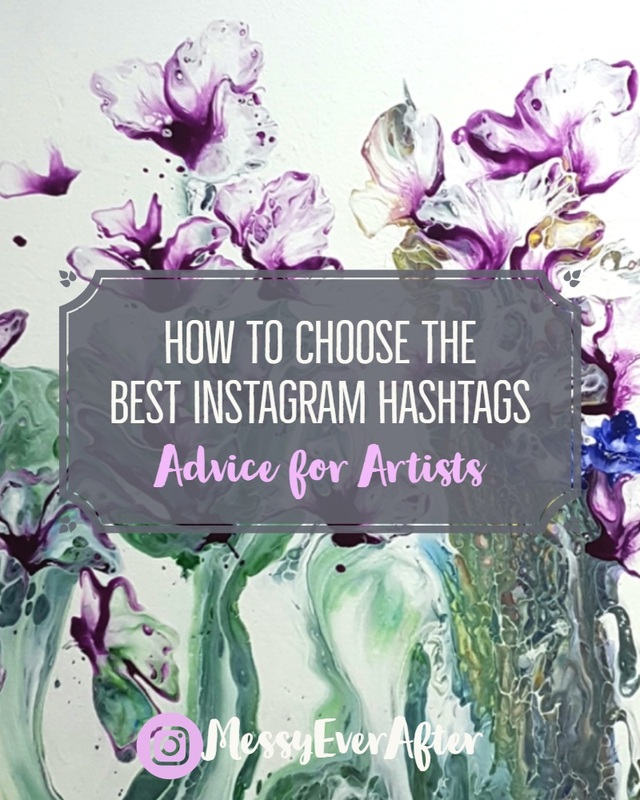 If you are new to Instagram, or have been struggling with getting new followers, your hashtags might be the issue. When I first started posting my art, I would pull tags out of my head. I’d look at my art and brainstorm all the ways to describe the piece right when I was posting. My tags were generic and I only used a handful of them, because I didn’t know how important they were and I frankly didn’t feel like wasting too much time on the posting process. When I search for those tags now, I see they have millions of posts behind them. It’s no wonder why I didn’t see progress on my account for months. I was doing it all wrong. I started researching different tags a few months ago and I believe it was one of the huge contributing factors to my quick growth. I don’t want to repeat too much of the information that’s already out there so I’ll just say: Hashtags are really important. Yes, there is a right way to use them. Don’t worry, I will show you how. You can use 30 tags per post. I suggest using them all, but don’t go over. If you have over 30, your image or video will post without the caption and tags. Currently, my list is around 26 tags so I can add some here and there depending on the post content. If you have heard it’s spammy to use all the tags—ignore that. If your caption is genuine, your content is attractive, and you format the caption well—it won’t look spammy. Make sure you have a good balance of small and large tags. If you are using all 30 tags, but each tag is generic and overused, you’re not going to benefit much. If your account has a small following, focus on small tags. Pay attention to the top nine of your chosen hashtags. The goal is to get into the top nine posts of some of the tags you use. The more engagement your post has, the more likely it will move up in rank. And if you’re in the top nine, it will drive even more people to engage with the post and follow you. Post your tags in your caption and not as a comment. I’ve read conflicting articles on this. Some say you shouldn’t post tags in the caption, because it looks tacky and spammy. 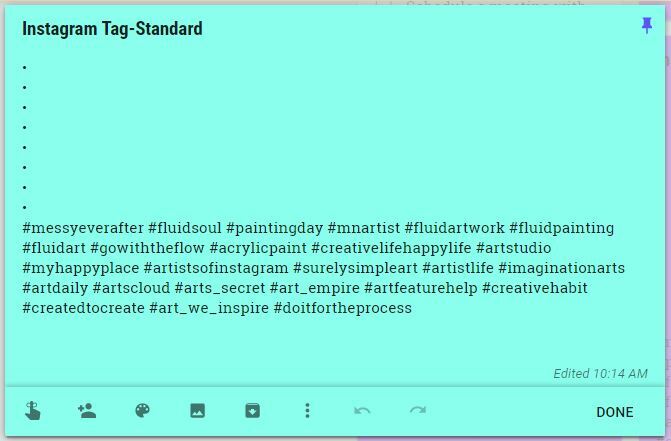 Solution: Add 5 or more symbols and lines between your caption and tags so the tags show up further down. Solution: Post the tags in your caption, but ask a question to your audience to encourage genuine engagement. “What’s your favorite medium?” “What does the color scheme make you feel?” etc. Sit down and do some research. I’ll show you how I do it! It’s tedious, but I will show you how I get a healthy list of tags that I just copy and paste into posts for a couple of months until I have to sit down and research new ones. Again, hashtags are important–but more specifically hashtags that have a narrow focus and fit your brand are important. As part of defining your brand, you need to know where you fit into the art world. What kind of art do you create? What materials do you use? What kind of feelings do your pieces evoke? Knowing the answers to all of these questions will help you better market yourself, choose the right tags, and find your audience. Also, a lot of share accounts choose different works to share from specific tags. Some have their own tags, and some pull from tags already in use. I wish there was a list of share accounts out there, but it’s an ever changing network. You are more likely to find these accounts when you are researching tags. This won’t be as effective, but it’s a start if you don’t have the time to research. Find an artist similar to your style that has a larger following than you (but not too large). Look at their posts with high engagement (most likes and comments) and copy their tags. Voila. Your work is done. Get on your computer. Open up a spreadsheet (or use this worksheet). Crack your knuckles and head to Instagram. Search for a tag relevant to your art. For this example, I’m going to use #acrylicpaint. Below are the top nine posts for this tag. I happen to have two pieces in the mix at the moment, but I’m going to look at the middle row, right side for inspiration. Okay, so looking at this post, it has high engagement and actually happens to be a @brittleeart piece from share account (I’ll tell you more about what to do with this later.). Now, what I do is examine all of the tags and start clicking on each one to see if it would fit my style. If I find a ‘good’ tag, then I explore its top nine. Select another post, check out those tags, find another good one, explore the top nine. Repeat. 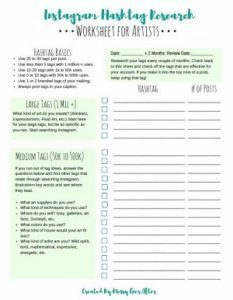 While I am clicking back and forth, I have a spreadsheet open to start recording different tags and information (or use this worksheet). Below is a screenshot my research. On the left are tags that I have already been using. 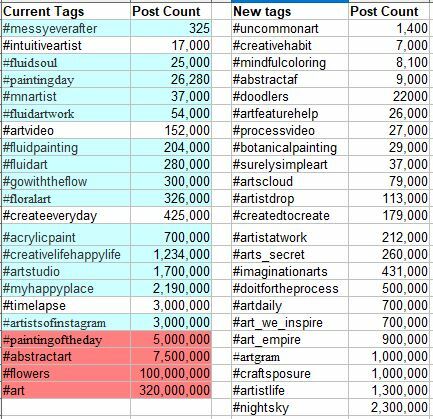 Blue means I’ve made it to the top nine, red means the tags are too big and my work is nowhere to be seen. I’m not going to use the red tags anymore. The right side are the new tags I researched today. A lot of my tags are above 50k uses, but I am having success with the larger ones so I keep using them. As your following grows, you can find success with the larger ones as well. For now, start on the smaller end. What makes a hashtag ‘good’? Now, you can see from my list that I don’t use a lot of one word tags or simple tags. I choose much more specific tags. Don’t use #art, use #uncommonart. Don’t use #abstract, use #abstractaf . I have to admit that the more I research tags, the more excited I get when I find a really good one. So what do I look for in a tag? The tag has quality content. The top nine photos are attractive and have genuine engagement. 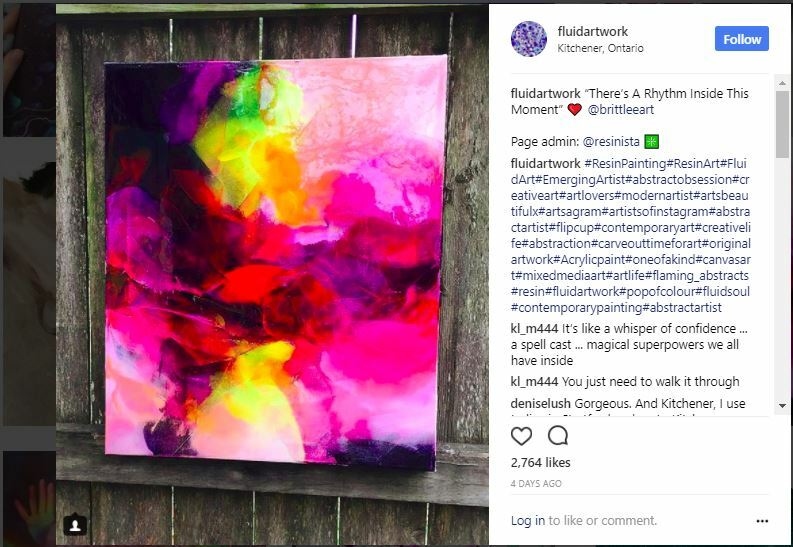 The tag is related to your art and your brand in some way. Can you see your work fitting in here? The tag is currently in use. Click on the first post below the top nine. Was it posted today? Then you’re good. The uses are between 1k to 50k. The tags are more specific and targeted to a smaller audience. You’d think you would want to display to the largest audience you can to get exposure at first, but you want to do the exact opposite. Find a small dedicated audience. Their engagement is going to mean so much more for you, your account, and your business. Start with a generic tag related to your work, or a tag you already have success with. 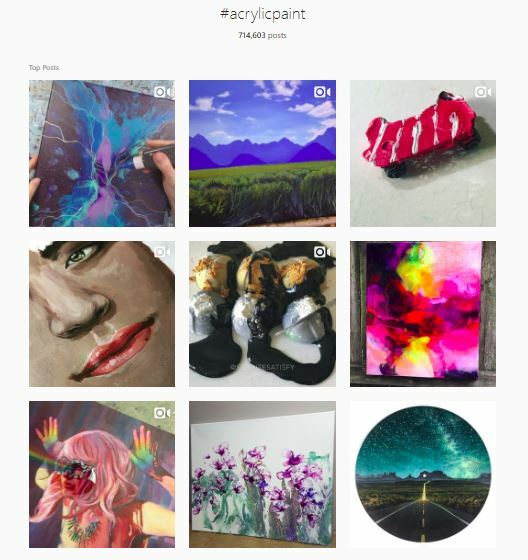 Click on the post with the highest engagement in the top nine that is most similar to your art and brand. Review the tags on that post, copy the tags that are smaller and targeted. Click on them and see if the content is relevant, the post uses aren’t too high or too low, and if the tag has recent uses. Record your tags until you have a list of 25 or more. I honestly spend an hour or two researching tags, but once I have a list I format the basic layout and copy it into Google Keep. I have Notes for different post content–videos, new products in my store, and my standard tag list. Now when I have new content to post, I just copy this to my clipboard and head to Instagram. I will review my tags in another 2 or 3 months and see which ones aren’t working for me and I’ll switch things around. Again, I know this process is a little tedious, but it is so beneficial! I hope this was helpful for you! If you have any questions, please comment below. I love getting inspiration for new blog posts and your questions are always so helpful. Also, if you want one-on-one help for your account, don’t hesitate to reach out to me. I am happy to offer my consulting services. Btw, what is a shared account, and how do you know if it’s shared? I’m so happy you found it helpful! Sometimes it does take time to figure out where you fit in the art world. Patience is definitely needed! A share account is usually a larger account that borrows content from other creators. Check out: @sketch_daily or @art_supernova. Accounts like this will usually include something in their bio to indicate they are looking for artists to share. This is a helpfull article, so nice of you to share it. I also have an insta that doesnt yet have a lot of followers (its myrthe.in.colours)Sometimes it frustrates me a litle to see people with way worse content have so much more followers haha than i think, what am i doing wrong? Maybe this will help me tackle that, thanks! Haha, I’ve been there! I think this will definitely help! Let me know how it goes. That is so selfless and kind of you to help other artists trying to make it in the Instagram ocean. I am very happy to help! Thank you for reading and supporting what I do! My instagram account has very few likes or followers I put it down to my work is not very good! I just checked out your account, and your art is not the problem at all! Your work is great. Let me know how the changes go. I can definitely see your following growing with the right tags and posting more often. If you ever want an outside opinion and help with tags, I’d be happy to take you on as a client. That’s an awesome way to get your work out there! Thank you so much for writing this post, Im taking your advice and I am currently sitting with my own excel spreadsheet to figure all this out. You are so very welcome! Let me know how it goes! I’ll also add that you should use your location like a hashtag! Add a location to all your IG photos (if you’re comfortable doing so) so local folks can find you. And if you’re in a big city like I am (Chicago), use a neighborhood location rather than the whole city so you have a better chance of being seen–same logic as using the more specialized hashtags. I enjoy finding local businesses this way and a few have found me too! It’s easy to avoid doing the research at first! I still put it off when I need to revise my tags, because there are so many other things I want to spend my time on, haha! Great article! Thanks for taking your time to prepare it! What a fascinating and interesting insight to the pros and cons of Instagram hashtags. John, I am so happy to know this was helpful for you! I wish you luck!